Wound and mucous membrane antiseptics can be based on chlorhexidine digluconate, polihexanide, hydrogen peroxide, sodium hypochlorite, povidone iodine or octenidine dihydrochloride. In addition, silver may be used as antimicrobial agents for wound treatment, e.g. in wound dressings. A health benefit can at least be expected for patients with infected or critically colonized wounds. A low adaptive response in combination with a frequently observed inhibition of biofilm formation and strong removal of existing biofilm can be attributed only to povidone iodine. Sodium hypochlorite and hydrogen peroxide also revealed a low adaptive response but can enhance biofilm formation and have only a moderate biofilm removal capacity. Limited data with octenidine dihydrochloride show an inconsistent picture. Polihexanide can exhibit a strong adaptive response in Gram-positive species. Its biofilm removal capacity is poor. Chlorhexidine digluconate and silver may both show quite frequently a strong adaptive response, mainly among Gram-negative species. Silver can inhibit biofilm formation, whereas the effect of chlorhexidine digluconate is inconsistent. For biofilm removal, silver nanoparticles have mostly a moderate effect, and the effect of chlorhexidine digluconate is mostly poor. 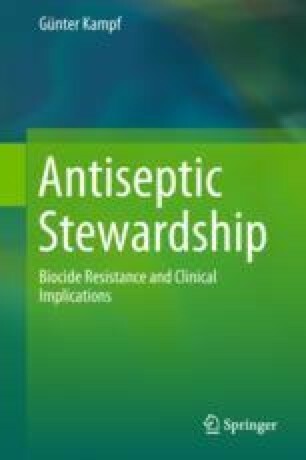 Overall, povidone iodine seems to exhibit the lowest selection pressure including cross-tolerance to other biocidal agents and antibiotics and chlorhexidine digluconate the highest.